Vice President Mike Pence breaks Senate tie to confirm Betsy DeVos as Education Secretary, 51-50. OU lauds Devos confirmation. 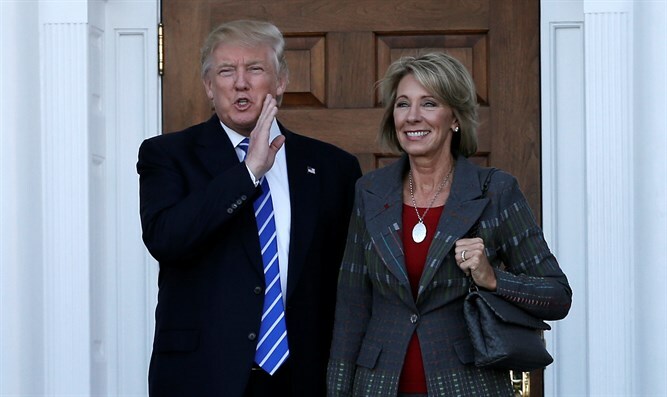 Betsy DeVos was confirmed as Secretary of Education, with Vice President Mike Pence casting the tie-breaker in an historic 51-50 vote. DeVos, a Michigan billionaire whose advocacy for school choice has led to sweeping changes in the educational landscape in her home state, provoked divergent opinions in the Jewish community. Both the haredi Orthodox Agudath Israel of America and the Orthodox Union issued congratulations within minutes of the vote. It marked the first time a vice president broke a tie for a Cabinet confirmation. In a letter to the Senate Education Committee last month, Agudath Israel of America expressed support for DeVos, saying it had worked closely with her for years to change state laws that would make it easier to use vouchers for private schools, including religious schools. “Mrs. DeVos will be an education secretary who is focused on the needs of each individual student and not on where he or she attends school,” the letter said. In a separate letter to the committee, the Orthodox Union said DeVos “has a long history of advocating for and supporting” reforms favored by the group, though it stopped short of issuing an outright endorsement. The Reform movement’s rabbinical arm, the Central Conference of American Rabbis, was opposed to the nomination, as were the National Council of Jewish Women and Jewish Women International.